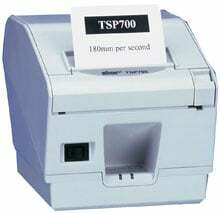 Star TSP743 - Thermal, two-color printing, 7 ips, parallel interface. Includes auto-cutter. Order cables & power supply separately. See accessories. Color: white. US Power Supply, Universal 24 VDC output. replaces (Part# 30781751). Also known as PS60A . The Star TSP743C-24 is also known as Star Micronics	STA-TSP743C-24	or TSP743C24	.